Mrs. Dora Ella Schwemm, 65 a resident at 213 West Main Street, Barrington for many years died Monday at the home of her son, Kenneth Schwemm in Fox River Grove following an extended illness. She suffered from a diabetic condition. Dora Ellen Lyons was born May 4, 1883, at Pilot Knob, WI. 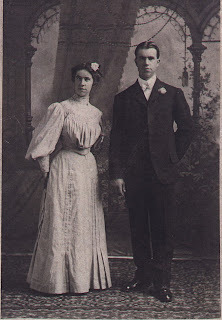 On July 26, 1905 she was married to August Schwemm of Barrington in Chicago where the couple lived for five years prior to settling in Barrington. Mr. Schwemm died Oct. 6, 1943. Mrs. Schwemm was a member of the Barrington Methodist Church and its women's organizations. Funeral Services will be held at 2:00 this Thursday afternoon at the Barrington Methodist Church with Dr. Bertram G. Swaney officiating. Until the funeral time the body rests at the funeral home at 149 West Main Street. Miss Olive Dobson will be the soloist and the following will serve as pallbearers: Arthur Waggoner, Henry Kincaid, Warren Schumacher, Henry ReDeadt, James Fraye, and Herbert Landwer. Burial will be in the Evergreen Cemetery. 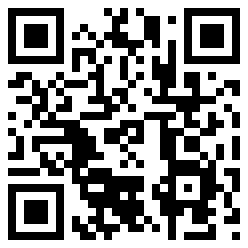 Genealogy, Google and UTube: Get On-Board! Name Tags - What Would Emily Post Say? 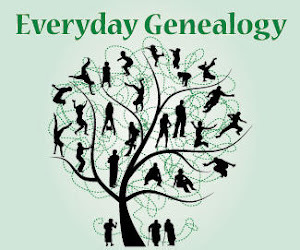 Stay Up to Date with Everyday Genealogy! How many hours a week do you spend doing genealogy research? 2012. Watermark theme. Powered by Blogger.